J. Durbin, S. J. Koopman, Time Series Analysis by State Space Methods, 2nd edition, Oxford University Press, 2012. A. Pole, M. West, J. Harrison, Applied Bayesian Forecasting and Time Series Analysis, Chapman & Hall/CRC, 1994. M. West, J. Harrison, Bayesian Forecasting and Dynamic Models, 2nd edition, Springer, 1997. There is a related package, dlm by the author of one of the textbooks. The dlm package has a vignette. The “CRAN Task View” on time series analysis says “dlmodeler provides a unified interface to dlm“. Also, the code and the book make reference to the first edition of Durbin and Koopman. Currently, the function only works for univariate time-series. Currently the implementation is very slow, but its speed will be increased in future versions of this package. On the subject, there is important discussion here, and in this recent paper, which models the matter using dynamical systems and invokes a transfer function interpretation. Being an engineer, I understand that and find that illuminating. (Accordingly, that paper by Orlić and Pasarić deserves its own response, something which I, at present, lack the time to do.) Note, however, that sea level rise is a non-linear process, and how quickly and how rapid depends upon ice sheet mechanisms we poorly understand, but are learning. 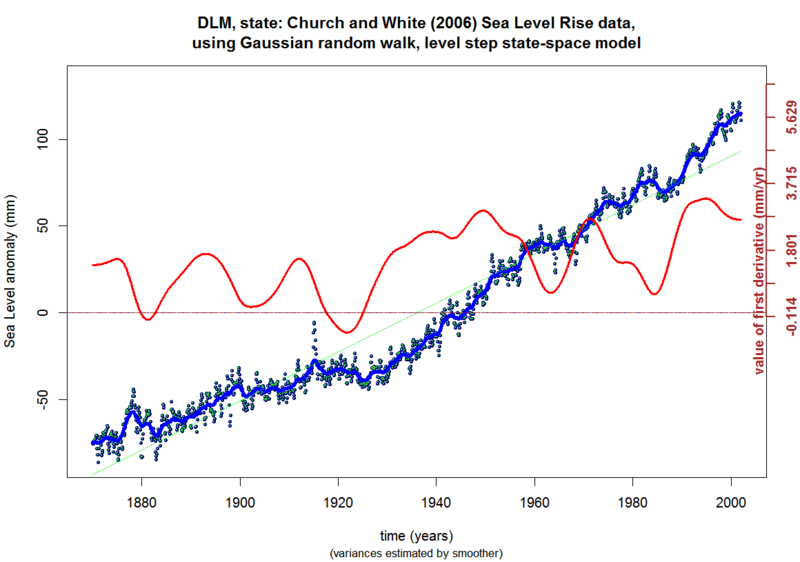 And speaking of sea level rise …..
By the way, if you are into Python and especially Python 3, check out the pykalman module. Incidently — and gratuitously — Anaconda Python from Continuum.IO just rules. This entry was posted in Bayesian, geophysics, mathematics, maths, oceanography, open source scientific software, Python 3, R, science, sea level rise, state-space models, statistics, stochastic algorithms, time series. Bookmark the permalink.